Staying at the cutting edge of research is tough as a sole practitioner. That why at ATPC we have a huge focus on both internal and external professional training. To be at the forefront in the field of physiotherapy by providing distinguished therapeutic service keep pace with states and world’s centers of high reputation in the same field. ATPC is a like-minded physiotherapy center based in Amman, Jordan. The ATPC was established in 2012. While the focus of ATPC has remained on solving the individual needs of the patient using the latest in evidence based methods, other things have changed. Our ATPC team continues to grow and has expanded to a team of 10 staff including 6 physiotherapists, and a wonderful friendly and caring reception and administration team. Welcome to the ATPC Family! One of the benefits of working at ATPC is the friendships that our staff develops with clients. You truly do become one of the ATPC family... and we like that! We look forward to you also joining the ATPC family and benefiting from our exceptional healthcare. 1. Patient first: we respect patient’s opinion and his/her need is first priority for us. 2. Respecting the patient’s privacy and principles : we strongly believe that each patient has privacy and principles that no one has the right to violate them and their confidentiality must be maintained. 3. Follow-up the patient and the progress of his/her condition . 4. Teamwork: there is no way for mood in providing our services as we are working in the center as a family with common goal and principles , No for selectivity and individuality. 5. Honesty and sincerity: are objectives we are seeking to consolidate and be characterized with. 6. Responsibility and accountability: our motive to be distinguished is the sense of responsibility, Our commitment to accountability is on the basis of our commitment to the ethics of our profession that we love. 7. Continuing education: to meet our objective will do continuous search to be updated with the new in physiotherapy field and will develop the skills of the staff . Provide therapeutic service that is distinguished, safe, high quality and at reasonable cost. Furthermore; the center committed to search for all means of scientific development, to use modern equipment’s, and to employ qualified medical staff in order to develop and promote the service level that is provided. Our main concern in ATPC is the team work and the relation between the patient and the therapist by allowing the patients to participate in their treatment plans provided by our physicians and therapists, also discussing the goals aimed by the patient and therapists. ATPC aims to present the manual therapy and exercises in all treatment plans and consider it as a main part of treatment. We aims to present a treatment plan that allow the fast and full recovery of the patients. As we aim to be in the top we concentrate in communicating with other medical field in the society. Heidi graduated from the University of New England in Maine, USA in 1998 with a Bachelors of Science degree in Physical Therapy. Since her graduation she has worked in hospitals, private out-patient clinics, inpatient short-term rehabilitation and long-term care in nursing homes. 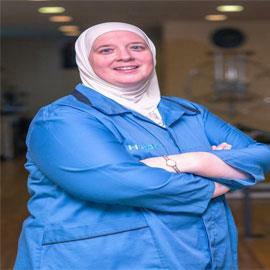 Her various practice settings have allowed her to work with patients of all ages and with a wide range of diagnoses. Her continuing education includes PNF, treatment of torticollis, women’s health issues, bariatrics and geriatrics. She began working at ATPC in August of 2013.